In May, the USMMA created a new show kit for all members to use at their events. We used to have show kits for this purpose in the past, but over the years, the items have been lost. When we were unable to procure the ABCCMM’s show kit from the PBR for an event, we knew it was time to replace our USMMA show kit. Any member can use the kit - all or just part of it - at their events or local shows. We just need to have plenty of notice in order to keep shipping costs down. The member requesting the kit needs to pay for the shipping one-way. The USMMA will pay the shipping one-way. A new process for inventorying the kit before it is shipped and checking the items back in will be instituted. -Miscellaneous: like Red Horseshoe M brand laminated signs, Shannon Ford Ritmo postcards, DVDs, sample magazines, M brand hats, tape, zip ties, demo scripts, sample setup ideas and lists etc. I would like to create a second show kit to be housed on the East Coast to save on shipping expenses. I also would like to create a new media show that shows EVERY single Marchador here in North America - still photos or videos and for that we are also requesting photos and videos. We may also use youtube videos and USMMA library photos in there that are already great. Just point us to your public library or send us your favorite photos and videos. They also need to be high-resolution as we are playing on a big-screen TV. 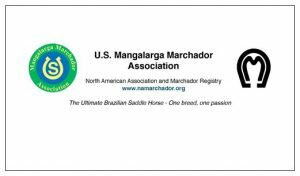 This supports our goal to promote the Mangalarga Marchador horse! We look forward to many, many more events to help you do so!